This next concept device is so odd that I just had to report on it. This device, which is simply called The Light, is an ordinary map that, when rolled up like a kid’s pretend telescope, will become a flashlight. How does something like this work? 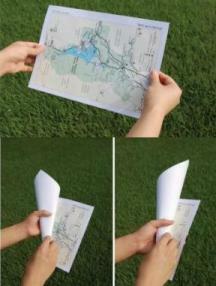 First, the map is not an ordinary map, but two sheets of paper. On one of these sheets is the actual printed map itself, while the other is a cover sheet with two electrodes. Second, simply roll up the map so the two electrodes meet, and this union turns the built-in LEDs on. This device is powered by a thin battery that fits in between the two sheets. So, if you are ever lost in the woods, and it is getting dark, just roll up your map and make a flashlight to find the way home. Unfortunately, there doesn’t seem to be a way to use the flashlight to illuminate the map. I guess you should probably carry a compass with you if you’re hiking, or just carry a flashlight. All right, so the device has one logical flaw, but what of it? Truth be told, designer Owen Song had me at the rolling up paper into a flashlight. Good luck trying to find a company to market it. One to illuminate the other. It’s marketing genius at work.